For decades his plans were regarded as so crazed that they were confined to specialist books and institutes. Yesterday the taboo was broken. Peer Steinbrück, the German Finance Minister, unveiled a scale model of Germania, the Führer’s supersized city. Centrepiece of the display was the domed Great Hall, planned by Albert Speer, Hitler’s master architect, to accommodate a crowd of 150,000. “We wanted to avoid this exhibition being seen by the wrong people,” said Karl Dettmaer, deputy director of the regional picture archives, which first tried to deal with the sensitive Germania issue in the 1980s. The new Indiana Jones LEGO sets won't include Nazi minifigs -- a decision I wholeheartedly agree with. If you really want them, you can make your own. These LEGO Nazis are wearing LEGO-compatible (i.e. 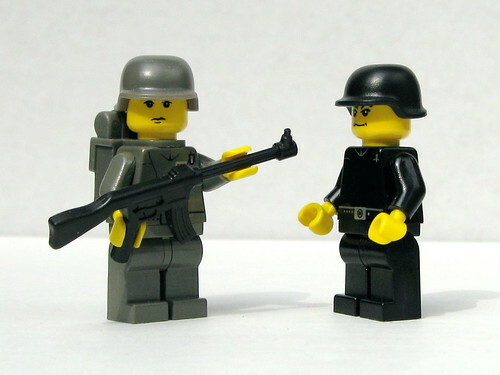 not LEGO) BrickForge "Military Helmets" and the gray one is armed with a "Sturmgewehr."